Home Collections 2 Tier Chrome Plated Steel Dish Drainer Just $20.69 Down From $69.99! Ships FREE! You are here: Home / Great Deals / Home Collections 2 Tier Chrome Plated Steel Dish Drainer Just $20.69 Down From $69.99! Ships FREE! GearXS has this Home Collections 2 Tier Chrome Plated Steel Dish Drainer on sale for $20.69 (Reg. $69.99) when you use promo code GXS-TIDY + FREE shipping! Dry dishes extra fast! 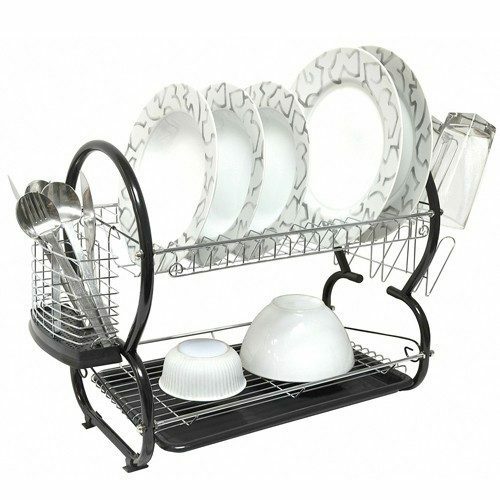 This Home Collections 2-tier Dish Drainer is a Stainless steel dish rack that holds and dries up to 17 dishes. It provides plenty of space for draining and drying dishes. The chrome finish stainless steel wire rack has slots for dishes, spaces for cups and a silverware holder. The durable compact design is easy to clean, and resists rust and moisture. Order today while supplies last!